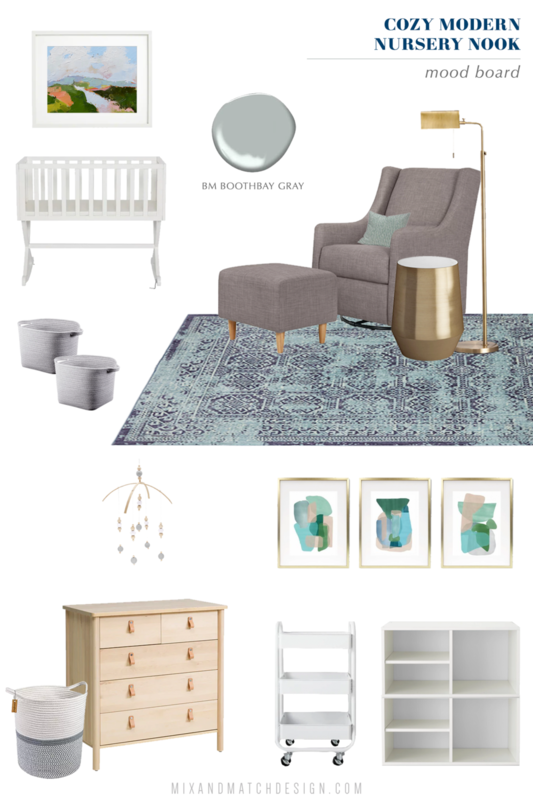 With baby boy set to arrive anytime in the next few weeks, I’m thrilled to have his nursery nook finished and ready to share with you today! Though it felt like it was a long time coming, it came together quickly once everything arrived, and I love that he has a special spot in our home now. 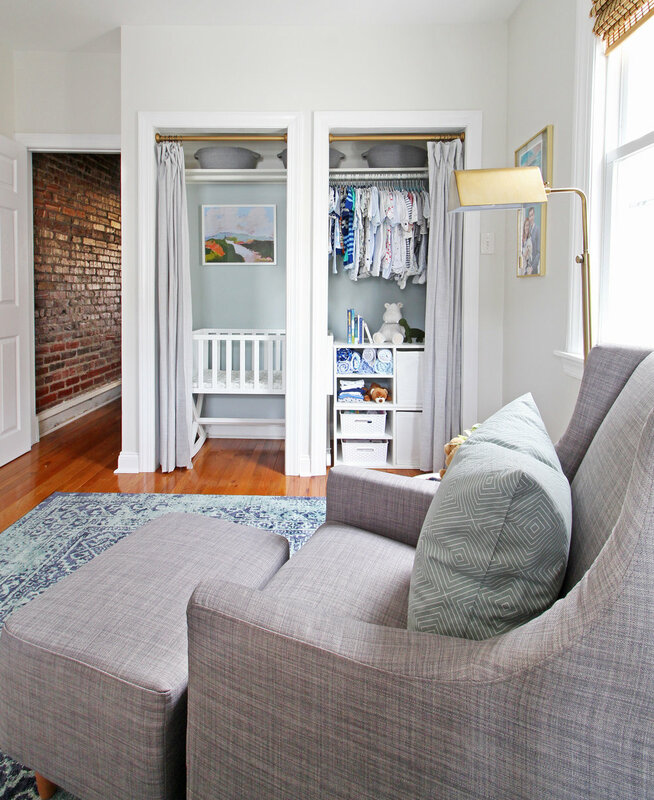 My goal was to carve out a small nursery using part of my office and the double closet in there that felt cozy, modern, and blended in well with the general style I already had. I think I succeeded in making this shared space work well for both me and our new addition! 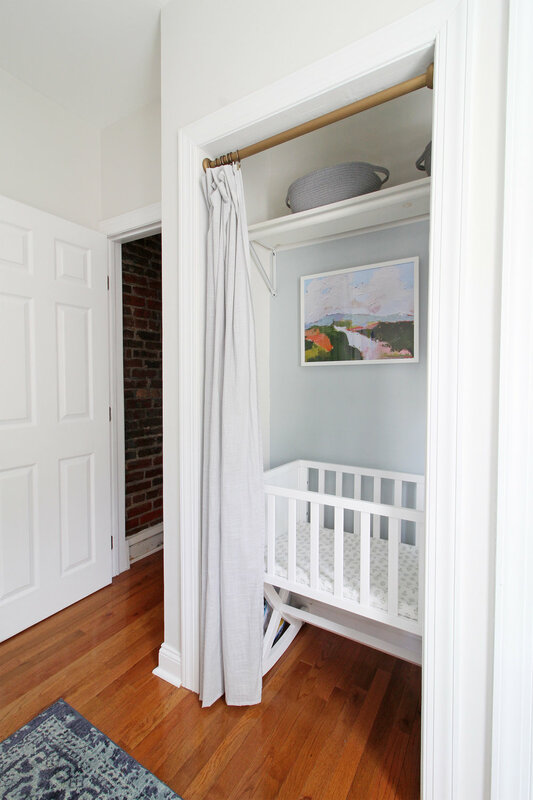 If you’ve got a small home and are looking for some inspiration for a small nursery, I hope this space is inspiring and gives you some ideas! I ended up pretty close to exactly what you see here with a few minor changes. In particular, rather than going with the Boothbay Gray paint color in the back of the closet, I chose one that had a little more blue in it called Wales Gray (both of those are Benjamin Moore colors). It turned out to be the perfect muddy gray blue! Most everything else you see here was what I ended up using in the room - I’ll walk you through everything in the nursery photo tour below. Since we have a nice size closet in my office, I decided to make the most of it by using half as storage for clothes and other items, and half as a sleeping area. I found what I thought was a perfectly sized bassinet/cradle, but ran into a minor problem - the online measurements were wrong and it was bigger than advertised! We managed to maneuver it in there to fit (barely! ), but it’s tight. While I could have returned it and gone on a hunt for a slightly smaller one, I was ready to be done by that point, so we made it work. Is it absolutely perfect? No, but that’s totally ok. Above the bassinet I hung one of my absolute favorite prints from Juniper Print Shop called Riverside. I love how it brought in some of the other colors I had in the room and feels like a little surprise in there above the cradle. Hanging art in closets isn’t something you see a lot, but I love it here! We managed to squeeze quite a bit of storage into this closet - way more than I imagined! There’s still room to grow in here too, which is a bonus. I hung up a lot of the clothes we have and put the rest into the dresser drawers. The simple shelf units* you see are from Target - I added some bins to them to corral some of the less-than-pretty items and put the cuter items like muslin blankets, onesies, books, and some stuffed animals on the open shelves. I can easily reconfigure them or change up what I store here as needed - I think flexibility is key when as storage needs evolve and these are going to serve us well for a long time. Moving around to the next wall is our little dresser and changing station setup. That dresser is the Bjorksnas from IKEA and it is SOLID. It’s a 100% wood frame and those leather pulls are fantastic. I’m proud to say I assembled that baby all by myself at 35 weeks pregnant (and once it was finished I decided that was the last crazy thing I’d be doing this pregnancy!). The changing pad fits perfectly on top of it and the rolling cart next to it has a bunch of changing, feeding, and cleaning supplies in it for easy access. 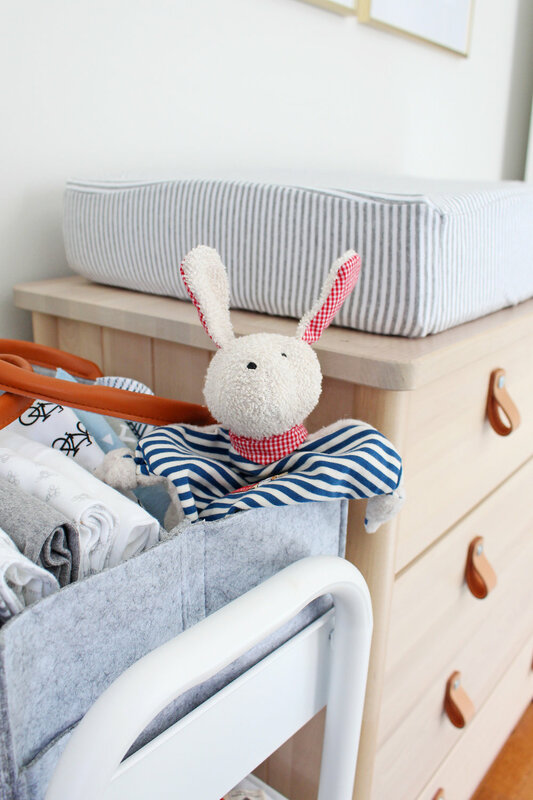 I plopped a gray and white laundry basket on the other side since I hear babies create quite a bit of laundry - even if it’s all tiny items! Two of my favorite details in the dresser area are definitely the trio of art prints and the mobile. I went on a long search on Etsy for a set of abstract art prints in colors that would coordinate with the Riverside print in the closet and was thrilled to find these from a shop called Vivid Pictures. The watercolor-like abstract style draws in both the modern and eclectic aspects of the room quite nicely! I bought them as a set of downloads, had them printed at my local FedEx Office, and framed them in these Target frames. 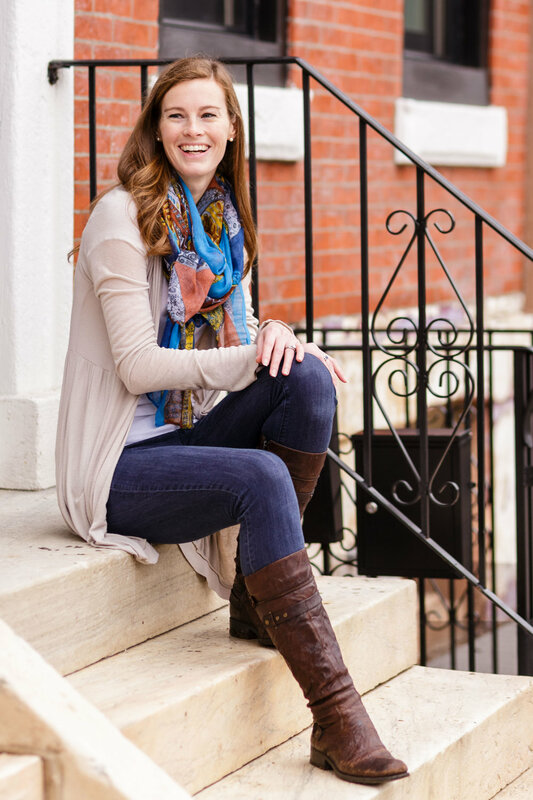 Printable art is one of my very favorite ways to add art affordably to a room - it takes a little more logistical work on your end, but it’s totally worth it to be able to fill a wall on a tighter budget. The mobile has a modern minimalist design and I found it on Amazon! I wanted something that fell into more of a Scandinavian style to coordinate well with the simple lines of the dresser and fell in love with this one. Amazon has a surprisingly large number of mobiles similar to this one, so if you’re in the market, take a look over there. As a quick aside, I had to make sure to grab a shot of this little red, white, and blue bunny lovey since it was the first gift we bought this little guy! We picked it up in Paris when I was about 7 weeks pregnant - it was still so surreal at that point, but we wanted him to have something to commemorate his first big trip overseas. :) We actually used it as a prop when we told my parents we were pregnant too after we got home. I can’t wait for him to hold it in his little hands soon! The final major piece of the nursery is the glider and ottoman. I have a feeling I’ll be spending a lot of time in this spot, so it was important to find something comfortable. Striking the balance between comfort, style, and budget with upholstery is tough, but this pretty gray one had a ton of positive reviews and was very reasonably priced, so I crossed my fingers that it would work. Well, it turns out the reviews were right and it is quite comfortable! It’s hard to beat $499 for a glider and ottoman that feels modern, streamlined, and fits well into our small space! I’ll leave you of one last image of the multifunctional nursery closet. I can’t believe how much we packed in here, yet it still feels open and airy! We plan to leave those curtains open most of the time, so I wanted it to be a spot that I liked looking at every day. I’m so glad I decided to paint the back of it blue - it’s soft and subtle, but adds just the right amount of contrast against the white furniture. I can’t believe there will be a tiny human living in this space soon! We’re ready for you, little man!